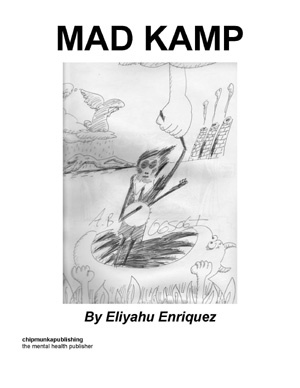 Mad Kamp is a scrapbook of Pinoy Piyyutim chronicling the schizophrenic journey of a Psychiatric Survivor. Mad Kamp weaves a variety of poetic genres, from traditional free verse to contemporary spoken word, indented to the right of the page: a simple, stylistic signature that grafts the mysticism of Kabbalah with Kundiman kisses into a wild, bamboo branch of fresh, revelatory ink. The heightened language in Mad Kamp invites the casual reader into disorientation — as involuntary electroshock — invoking Arthur Rimbaud's Une Saison en Enfer and Allen Ginsberg's Howl. Ultimately, Mad Kamp hopes to galvanize the Reform Psychiatry Movement from virtual obscurity toward Global Liberation, all the while encouraging the nameless, faceless, persecuted savants to dance courageously to the heartbeat of their own Rainbow Djembe. Eliyahu Enriquez is a Queer Abolitionist, born the Year of the Dragon 1976. As an undergrad, he was straitjacketed and labeled Schizophrenic. Soon after, he completed a B.A. in Psychology from Fordham University at Lincoln Center and has since worked in various Therapeutic-State settings. A stellar resume did not save him from the unforgiving tentacles of the psychiatric pimp industry, administering systematic violence by forcibly ingesting/injecting/abusing him. Discharge after discharge, their Big Pharma-magic did not cure him. The theft of his dignity only spurred him toward justice. He recalls the echo of "Quiet Room" torture chambers from within the sinister hallway. Squeaky Gurney. Asphyxiating Straps. The victims of psychiatric concentration camps haunt him as he assimilates into society's modi operandi: business-as-usual. Do you hear their totes drag on in a hopeless haze, step-by-sedated-step? Our struggle for Liberation continues. He will not wait for calculated manifestations of psychiatric terminology. Eliyahu davens, in accelerated bows toward Jerusalem's Wailing Wall, like prophetic madmen of old: "May we merit the collapse of the psychiatric monstrosity in our lifetime, ameyn?" Ameyn!